It's quite rare that I come across a craft that I have all the tools and skills to attempt that also gets me excited to try my hand. It's not that I don't get excited to try things, just that I've already tried so many over the years. I first read about sewing rope into bowls and baskets here and since have peeked around to see what other people are making. There's a highly recommended online course if you want a little instruction, but I have to admit that I'd hardly finished watching the introductory video before I headed upstairs to try my hand. I've been making all kinds of baskets for as long as I can remember - paper, reed, pine needle, crochet, willow, fabric, etc. What is exciting to me is that sewing rope feels more like coil building with my beloved ceramics. It's been several years since I've set foot in a ceramics studio and while I long to return, I think that sewing these practical, economical, and beautiful forms may tide me over until I'm able to get my hands in clay again. In order to have every thing be in its place, there must be a place for every thing. Even amidst the big changes that are currently taking place in our life (I'll tell you as soon as I can, I promise! 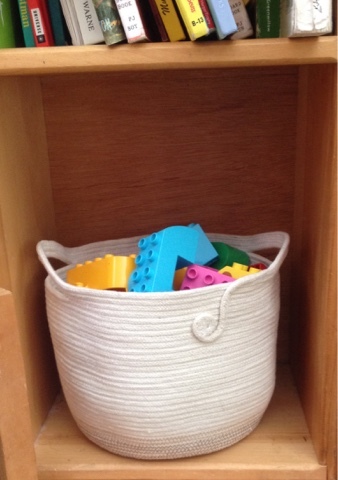 ), I think I can carve out a few minutes here and there to add some simple, beautiful, delightfully useful baskets to our life. I like the different colors of thread at the bottom. Was that your brilliant dirt hiding effort?